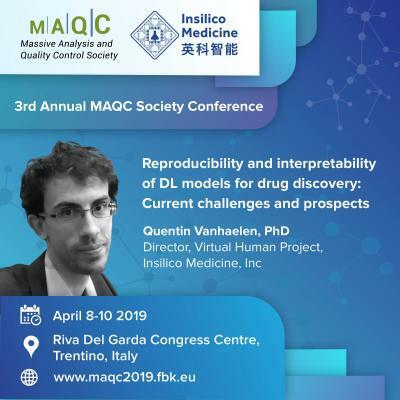 Tuesday, April 2, 2019 – Insilico Medicine, a biotechnology company developing the end-to-end drug discovery pipeline utilizing the next generation artificial intelligence, will present its latest results in modern and next-generation AI for Drug Discovery at the 3rd Annual MAQC Conference in Italy, April 8-10. Deep Learning methods have proven to be an effective tool to optimize key steps of the drug discovery pipeline, such as target identification and design of molecular compounds with desired properties. However, the systematic application of DL within these fields and for high-stakes decisions in healthcare drives specific demands for better interpretability and reproducibility. While the specificity of DL architectures and learning processes require adapted solutions, researches are currently undertaken to design computational methods and workflows which can be used to make these types of approaches more interpretable and guarantee that results are reproducible. The presentation will focus on the aspects that make achieving reproducibility challenging, ways of resolving potential issues, as well as recent developments that aim at making DL models more interpretable. “We are happy to present our latest research at the 3rd Annual MAQC Conference, which gathers the key longevity leaders. The topic of AI for Drug Discovery and Productive longevity is rapidly gaining popularity, and we are happy to be at the leading edge of this research and one of the innovation drivers in the area,” said Quentin Vanhaelen, Ph.D., Director, Virtual Human Project at Insilico Medicine. The focus of the MAQC 2019 meeting is the challenge of applying Artificial Intelligence and Machine Learning to biological, health, and medical problems, still adopting reproducible science principles for a medicine safely based on the trustworth and fair analysis of massive data. The event is held in Riva del Garda, Italy, on April 8-10, 2019.